Time to get into your kitchen a whip up a batch of possibly the best mince pies we’ve ever tried. Full of flavour and festive cheer, if you were ever thinking that you want to give this perfectly on point Christmas baked treat a bash then look no further, this is the recipe for you! Zest 2 lemons and 2 oranges, keep aside. Juice all your citrus (4 lemons and 2 oranges) and add both the juice and the zest in a saucepan. Add the brandy, apple juice, baking spice, coconut oil, vanilla, blackstrap molasses and sweetener to your saucepan, bring to a boil, remove from heat and add your dried fruit. Then add your apples, stir to combine and let cool. Once your mixture has cooled, give it another thorough mix and squish with your hands – this motion assists in the absorption of the delicious syrup mixture into the dried fruit. Store the mixture in glass jars or in a sparkling clean container, cover and keep in the pantry/anywhere that is dark and out of the way. To ensure the biggest and best flavour explosion you’ll want to leave this mixture to mature out of the fridge to soak up all the juices, a minimum of one day will yield the best results. Using your hands or a food processor, mix until the mixture starts forming a rough dough. Heavily flour a clean and dry surface with tapioca flour, turn your dough onto the floured surface and begin kneading until the dough is smooth and well incorporated. Divide the dough into 24 equal parts (to do this form a sausage with the dough and cut into sections using a knife). Using a rolling pin, roll out each segment to about 3mm in thickness. You can either use cookie cutters or a glass for the next bit, but you will need two sizes; one slightly smaller than the other. Using your cutter of choice cut 12 larger circles (your base) and 12 smaller circles (your lids) from your 24 dough segments. Decorate the smaller circles for a beautiful finish, or you can just leave them as is. 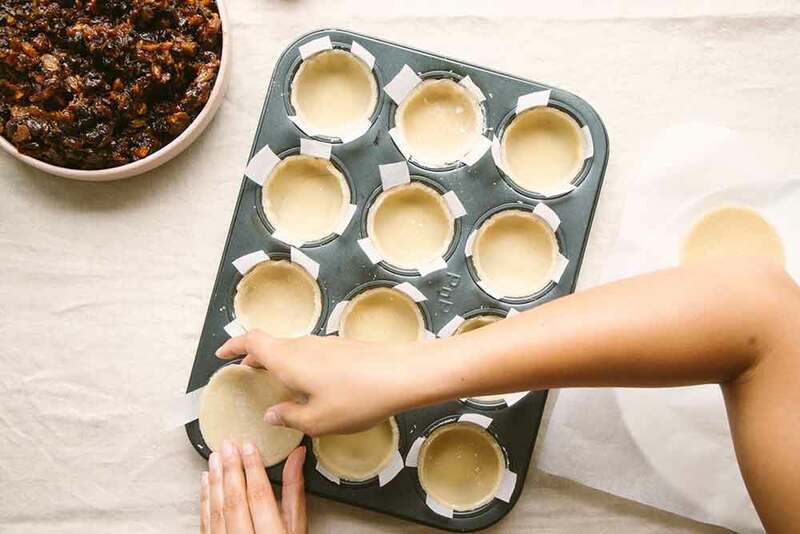 This is a big job so we suggest working in stages: prep your larger pieces first as these will form the base, once you’ve filled your pies create your 12 smaller circles (the lids). Preheat your oven to 160ºC. Cut 12/24 strips of baking paper, and line each muffin tray circle with one/two strips, make sure you leave enough sticking out over the edges: this will help with pulling out the pastry at the end (refer to image below). Line the muffin tray with your larger circle, forming the base for your mince pies. Scoop a ¼ cup of filling into each base and cover with a smaller circle (the lid). Bake in the oven for 20 – 25 minutes, or until the edges start browning. Let cool for 5 minutes, and remove from tray. We’re Tamzyn and Kaeli, two creatives from Cape Town seeking outlets without deadlines and better food than the cafes around our studios. That’s part of the reason why we channeled our love for recipe creation into our blog, Give a Fork, and why we teamed up with our friends at dinnerkit delivery service, UCOOK. We try to ensure that all our recipes are balanced, energy-sustaining and just generally delicious, because we Give A Fork about what we eat, and we hope that you will, too.